Director Adam Wingard and writer Simon Barrett are perhaps known in the film world as primary horror directors, with their previous collaboration – last year’s You’re Next – in particular displaying the genre conventions we all know and love with a mix of black comedy and self-awareness, not unlike the work of John Carpenter and Wes Craven. But while The Guest is much more of an action thriller than a horror, it’s not long before that genre suddenly starts to creep in to their work here and makes you realise that no matter how hard they try they are still horror filmmakers at heart. Take, for instance, its primary lead character. David, played by Dan Stevens (insert coy Downton Abbey reference here), is the unquestionable focus of the film; whatever occurs from the very first time we see him onward, which just so happens to be the first shot of the movie – itself a tense shot perfectly timed with some uneasy synthetic music – is entirely linked to him and who he really is. Stevens is in almost every scene, and even when he’s not there you can feel his overarching presence stick out like a sore thumb. That’s the sign of a truly compelling performance, and Stevens is no less than that. Quietly subdued one moment but tough enough to seem able to break your arm in several places the next, his is a screen presence that really leaves an impact. Charming as well as dangerous, there’s no doubt that Stevens controls the screen. However, it’s not long before the filmmakers’ horror roots start to seep through the gaps and into this mostly-different genre. Rather soon into the film, we are introduced to another group of characters – in particular the Peterson family including grieving mother Laura (Kelley), bitter father Spencer (Orser), and most notably their offspring Anna (Monroe) and Luke (Meyer). These people have the thin personalities of all those dumb teenagers one would find in a typical slasher movie, and some are so uninteresting and annoying that you neither care about them nor necessarily want them to live by the end credits. Monroe, in particular, has uncomfortably obvious “final girl” qualities about her right from the very first sexualised shot in which we see her, and though her acting is decent and, to the character’s credit, she does make some smart choices from time to time, it’s not enough to actually want her to survive the events of this movie. The horror stuff doesn’t come in until way into the third and final act, and before then we are forced to watch a decently-made thriller with these underdeveloped characters (bar David, who is by far the most interesting character of the bunch). Most of it is spent with David fitting in with the family and helping them out with their own personal problems – for example, David takes Luke, who is being severely bullied at school by a bunch of one-dimensional jocks, to a bar where he beats them up a la Patrick Swayze in Road House, and then later defends Luke from his school principal when he threatens to expel him for finally standing up to his tormenters. While you could argue that it’s all part of his plan to further earn the trust of the family, it’s a confusing message being sent to the audience who are having a difficult time trying to figure out whether they’re meant to be on his side or against it. It’s only until that third act where the answer becomes much more obvious, but before then we are constantly thrown in a loop over our feelings toward this guy: is he a villain or an anti-hero? Neither of these answers is clear enough, and it’s frustrating when we can’t figure it out for ourselves when so much stuff happens to contradict it. That said, however, some of the action in this movie is very well done. Stevens displays a talent for practical fight scenes whether they’re with guns or using his limbs, and it’s shot and directed decently enough that you can tell what’s happening. They are especially exciting when the action is happening to people who deserve their comeuppance, such as the aforementioned bullies, but as the film progresses that joy is reversed slightly and it becomes a completely different genre all over again. It’s a sign that the movie has some identity issues, which is rarely a good thing, and means it struggles to ground itself in whatever it partakes in. The third act, in particular, is when it becomes so recognisable – right down to the Halloween setting and creepy maze that the full-blown villain chases the protagonists down – that everything that came beforehand when it was much more confident in its thriller vibes just disappears right out the window. It also boasts an effective 80s synthetic score, which is always fun to listen to in modern thrillers, and a decent soundtrack which plays over its tonally-uneven scenes. 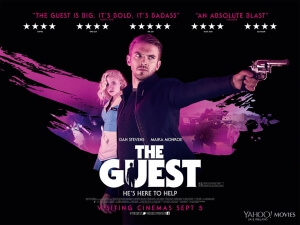 But aside from that, there’s not really a lot going for The Guest, which is a shame because there are definitely some enjoyable aspects about it but ultimately it’s not enough to justify a wholly-competent film. It’s one perhaps best left for a short-term stay only.